In the history of the biscuit and confectionery industry in Hong Kong, M.Y. San, M.P. 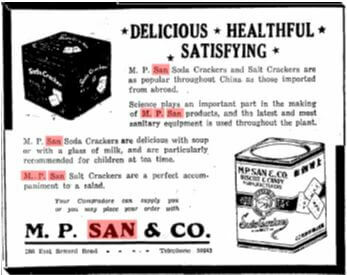 San and Pacific Biscuit & Confectionery were three prominent firms which shared a common root – they were all started by members of a Filipino Chinese family hailed from Zhongshan (formerly Heungshan) in Guangdong province by the surname of Mar (馬). Although none of the brands are still under the family’s control and M.P. San has faded into history, M.Y. San remains a popular brand in the Philippines while Pacific soda crackers remain a staple in supermarkets in HK and China today. M.Y. San & Co (馬玉山糖果餅乾公司), once the largest biscuit and confectionery manufacturer in HK and China, was founded by its namesake Mar Yuck-San (馬玉山,1878-1929, this English spelling of his name is based on US passenger records, his surname was Mar but since he also went by M.Y. San sometimes he was mistakenly referred to as Mr. San). A native of Heungshan, M.Y. 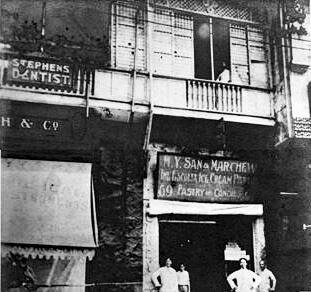 San moved to the Philippines in 1900 and in 1905 he established Escolta Ice Cream Parlor in Manila with the help of his two younger brothers and a fellow kinsman by the name of Mar Chew who learned the craft of baking in Honolulu, Hawaii. After initial difficulties, the ice cream parlor/bakery achieved success which enabled M.Y. San to expand into new markets. An ardent supporter of Sun Yat-sen’s revolutionary cause in China, M.Y. San decided to move back to China after the Republic was formed in 1912. He went to Canton, where he succeeded in raising $3 million in capital for the establishment of a large sweets and biscuit factory on Wanchai Road in Hong Kong and registered under British law, M.Y. San Co. Ltd in 1916. Shortly afterwards, a subsidiary was organized for the preparation and packing of sweetened ginger; and shortly after that, in order to supply the need of glass jars for the packing of the various products manufactured, a glass works was established. As MY San became a popular biscuit and confectionery brand nationwide, M.Y. San moved north to Shanghai where he established the group’s new head office. In October 1919, the M.Y. San flagship store was opened at 37 Nanking Road with much fanfare by Sun Yat-sen and other luminaries. A large factory and 2 additional stores were opened in Shanghai and soon branches were opened in Tientsin, Peking, Soochow, Hankow, Nanking, Nantung, Foochow, Canton, Macau and Surabaya. The variety of products by this time offered by MY San exceeded 200. By the early 1920s, the firm had over 700 workers in its factories and annual turnover of over $2 million. Realizing that the cost of sugar, the chief ingredient of his products, could be greatly reduced if purchased in the raw state (from the Philippines, Java and Cuba) and refined by his own firm, the ambitious M.Y. 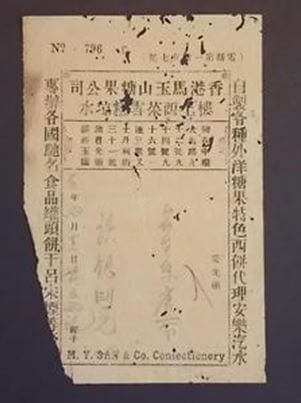 San formed the China National Sugar Refining Co. Ltd (中華國民制糖股份有限公司) in late 1921 with substantial capital (initially 5 million, later expanded to 10 million dollars) raised from prominent figures in Shanghai including the Cantonese merchant Lo King Kee (勞敬修former comprador of Reiss & Co who was also a director of M.Y. San, Sincere, Nanyang Brothers Tobacco and Bank of Canton), the prominent industrialist Chang Chien and Li Ching-fang, the grandson of Viceroy Li Hung-chang. In 1922, M.Y. San made a trip around the world to investigate sugar production in various foreign countries. He visited Great Britain, America, Germany, France, Holland, Switzerland, and Japan to learn the latest methods of sugar refining. He hired Uno Hartman, a veteran of the sugar refining industry in California and Hawaii, to supervise the construction of a large refinery at Woosung near Shanghai. Equipped with German refining machinery, the sugar refinery which was capable of refining 300 tons of sugar daily opened in 1925. Even though the Chinese Government granted a 10-year tax exemption for CNSR’s products, cost overruns, shareholder squabbles and external competition set the new venture up for failure and M.Y. San soon lost control of the refinery to his creditors and eventually it was absorbed by Japanese interests. Back at M.Y. San & Co, expansion was equally ambitious with the addition of 2 new red brick buildings at its Wanchai plant in 1923 and 1924 and the firm also went big into property – buying a block of 14 houses for $720,000 and hiring the top architectural firm of Palmer & Turner to design a 7 story building on 94-96 Queen’s Road that was estimated to cost “six lakhs of dollars”. Coupled with the heavy burden associated with the sugar refinery venture, M.Y. San found himself over-extended and in September 1924, malicious rumors were circulated about the financial viability of the firm, causing some shareholders to panic and asked for their money. In March 1925, M.Y. San & Co was forced into liquidation, which was administered by director Choy Hing (founder of the Sun Company department store) and Wong Kwok-sun (director of Sincere). According to one report, the liabilities did not exceed assets but the latter could not be immediately realized to meet the demands. Heartbroken, M.Y. San died in October 1929 while fundraising in Kwangsi province at the age of 51. The takeover of M.Y. San & Co by liquidators coincided with the Canton HK strike of 1925 which was very bad for business but despite of that M.Y. San mooncakes sold very well in Canton. After the strike died down in October, business gradually picked up and based on this the new manager CW Chang was able to convince creditors to convert their debt into a newly formed M.Y. San & Co (1927) Ltd which took over the business. However, without the leadership of its charismatic founder and with the competition of M.P. San which was formed by MY’s younger brother, the business struggled and failed once again in 1934 when it was taken over by its biggest creditor – the Nam Pak Hong trading firm Kin Tye Loong (controlled by the Thai Chinese Wanglee family). Plans to revive the business in 1936 never materialized and the Wanchai plant was demolished. The Canton business of M.Y. San was taken over by M.Y. 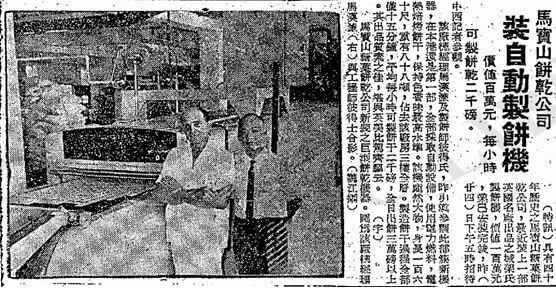 San’s business partner and in law Feng Kwan-loong (冯筠隆), who renamed the firm Yok Shan Machine Bakery (玉山机制饼, removing the last name Mar) – it closed for 8 years during the Sino-Japanese War but re-opened afterwards and was absorbed into Lingnan Biscuit Factory (岭南饼干食品厂)in 1953. M.Y. San biscuits advert in the Philippines. Today, the M.Y. San brand lives on in the Philippines and Taiwan. While M.Y. 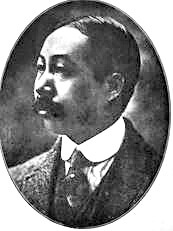 San was building his empire in China, his business in the Philippines was taken over by his partner Mar Chew. In 1935, Mar Chew died and his widow Chung Chi, who re-organized the Philippines operations as MY San Biscuits Inc and with the help of her children built its brand of crackers, Sky Flakes, to a staple in Filipino households after the War. In 2001, M.Y. 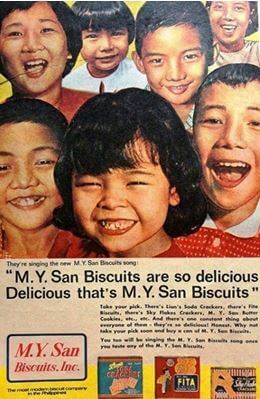 San Biscuits was acquired by Monde Nissin, a diversified food company controlled by Filipino Chinese entrepreneur Betty Ang and renamed Monde M.Y San. In Taiwan, the M.Y. San brand lives on with an interesting twist. In 1961, M.P. San (founded by MY’s younger brother to be discussed in details in the next section) established a plant in Taiwan to cater to the Taiwanese market. Operational difficulties forced them to exit in 3 years and a budding entrepreneur by the name of Tsai Kuo-yung (蔡國榮) took over the machinery and the M.P. San brand in Taiwan. He changed the brand’s name from M.P. San to Mayushan in Chinese (same as M.Y. San in Chinese but Greenmax in English) and formed Mayushan Foods (馬玉山食品工業) which became the leading manufacturer of Chines natural cereal products in Taiwan. A.R. Burt, J.B. Powell and Carl Crow, editors, Biographies of Prominent Chinese (Shanghai: Biographical Publishing Company Inc., c.1925), 67. M.P. San & Co (馬寶山糖果餅乾公司) was founded by M.Y. San’s younger brother of the same name, Ma Po-San (馬寶山), who was born in 1885. He worked for his brother in the Philippines and later served as the factory manager of the M.Y. San factory in Hong Kong. After the passing of his brother and the collapse of M.Y. San, M.P. San formed M.P. San & Co in 1929 in Hong Kong and set up a factory on Whitfield Road in Causeway Bay to make biscuits and confectionery products. For the firm’s logo he picked a horse head – horse being the Chinese character for his last name Mar and billed itself as the successor to M.Y. San (although M.Y. San & Co continued to operate until 1937 under different ownership). The firm quickly found success not only in HK but in China and Southeast Asia and by 1933 the HK plant was not meeting demand so a plant was opened on 288 East Seward Road in Hongqiao, Shanghai with capital of 180,000 dollars. The Shanghai plant produced 9 million pounds of biscuit and 2 million pounds of confectionery in its first year. According to a survey of Chinese-owned factories in Hong Kong conducted in 1934, the firm’s 2 story factory in Causeway Bay had $100,000 worth of equipment and inventory and did sales of over $400,000 that year despite of the difficult economic environment. The factory had 70 male workers (full time, earning 20-30 dollars per month, responsible for production) and 100 female workers (mostly part time, responsible for packaging). The plant was using 70 bags of flour per day and had daily production of 5000 pounds of biscuit and 500 pounds of confectionery. The Shanghai plant employed 250 workers and has $1 million worth of equipment, churning out products to satisfy the demand from various hotels, restaurants and department stores in Shanghai and North China while the HK plant handled South China and the export market (Africa, India, Mediterranean and the Philippines) since sugar was significantly cheaper in HK than in Shanghai. Stock certificate showed that in 1942, M.P. 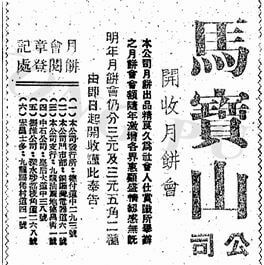 San was still president of the firm and he was supported by his nephew Mar Hon-min (馬漢文, son of M.Y. San) who served as second in command and general manager of the Shanghai plant. Directors of the firm included prominent merchant Lo King Kee (who was backer of M.Y. San, see above) and Huang Yi-chung (黃以聰), the brother in law of British American Tobacco comprador Cheang Park-chew (鄭伯昭). According to his bio in 1935, M.P. San was a hands on manager and sometimes went undercover as a worker to ensure the cleanliness of his plant and quality of his products. After the Communist took over in the mainland in 1949, M.P. San & Co continued to operate in Hong Kong and under the management of M.P. San’s son Ma Hon-lim (馬漢), the firm also offered mooncakes in addition to biscuit and confectionery. 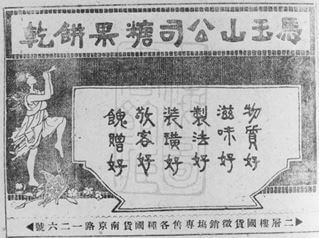 According to a 1958 advert below, the firm had a distribution center at 293 Des Voeux Road, a HK retail store at 61 Electric Road in Causeway Bay (through Ma Po San Land the family also owned 84 and 86 Electric Road at one point before selling it in 1957) and a Kowloon retail store in Yaumatei and also distributed through third parties. In 1962, M.P. San acquired a state of art fully automated biscuit machine from the UK at the cost of HK$1 million. The electric powered machine weighed over 88 tons and was 160 feet long, taking up the entire third floor of the MP San factory. It was capable of creating a batch of cookies every 15 minutes, producing 2000 pounds of biscuit every hour and 30000 pounds per day. 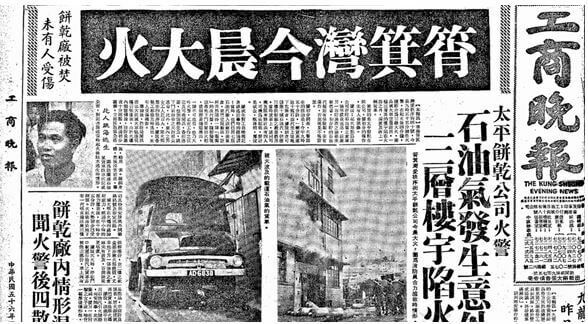 In 1972, Mar family members led by Mar Hon-Lim (馬漢濂) decided to sell their stake at MP San to the property developer Hang Lung which was interested in its Causeway Bay site at 40 Hing Fat Street. 10 shareholders including Hon-Lim’s younger brothers Hon-Cheung and Hon-Keung filed a lawsuit trying to block the sale. Nevertheless, the sale went through and on May 1973, M.P. San ceased production and arrangements were made with a Chinese restaurant in Central to meet the mooncake obligations to the subscribers to its mooncake club in Mid Autumn Festival later that year. The factory site was re-developed into Viking Garden which was completed in 1976. The firm M.P. San & Co Ltd, which was incorporated in 1937, was formally dissolved in 1977. Xmas Orders Keep M. P. San Factory Busy: Large Shanghai Department Stores and Cafes Favor M. P. San Crackers, Dec 12, 1935, The China Press. 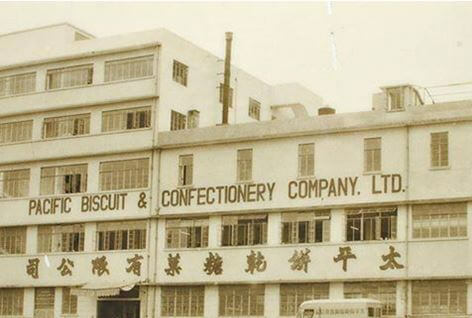 Pacific Biscuit & Confectionery Co Ltd was founded in HK in 1949 by Mar Po (馬保) and incorporated in 1953. Mar Po’s father Mar Kim San (馬金山) left Heungshan for the Philippines in the turn of the century where he established a Western style restaurant and a biscuit factory. It is likely that he was related to M.Y. and M.P. San but further investigations are required to determine the exact relationship. Mar Po came to HK and started his factory in a 10000 square feet site at 40 Aldrich Street in Shau Ki Wan which was purchased at a very low cost, making soda crackers, wafers and other biscuits. According to his fifth son Mar Keng Hong (馬景康), the early years were challenging and his father was very hands on. By 1960, Pacific was profitable and in 1962, it spent HK$1 million (a large sum at the time) to acquire a state of the art biscuit making machine from Indianapolis that tripled its production. The machine, which came to HK aboard the APL liner President Garfield and required seven trucks to transport, was capable of making 1800 pounds of sweet biscuits and 1200 pounds of salty biscuits per hour and required seven workers to assemble. Over time the variety of biscuits sold by Pacific grew from 2-3 to over 20 although soda crackers remained the top seller. In 1967, Pacific Biscuit made the headline as its Shaukiwan plant was burned down in a natural gas explosion – fortunately no one was hurt but some of workers managed to escape by jumping into the harbor. Mar Po was assisted in business by his brothers Ma Hoy and Mar Sing (both of whom served on the board of the firm) and in the 1970s, his son Mar Keng Seng (馬景成), one of his seven children, took over as general manager of the firm. Armed with master degree from overseas, Keng Seng continued to modernize the production line and also added products such as hamburger bun, sandwich bread and Chinese mooncakes. 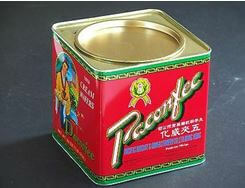 In 1990, the Mar family sold Pacific Biscuit to United Biscuits of the UK for over HK$100 million. The factory site was sold for $68 million and redeveloped into Hoi Fung Centre (海峰中心). United Biscuits in turn was acquired by Kraft in 2001 and today the Pacific brand of soda crackers and wafers lives on under Mondelez International, the food spinoff of Kraft. This article was first posted on 17th March 2017.